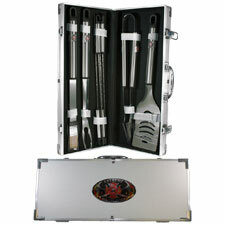 The firefighter BBQ Utensil set includes Spatula with serrated edge, Tongs, Fork, Four Skewers, Basting Brush and case with a newly redesigned "Extreme Firefighter" logo. Logo features Maltese Cross, flames and crossed axes with the words "Extreme Firefighter". Case is padded with velcro and elastic restraints for the utensils. Logo is found on both the case and untensils. Makes a great firefighter gift.